I’ve been teaching my 7 year old daughter from home for a couple of days every week. And something that I have been using a lot (most likely found on Pinterest) is the phrase, “It’s okay to not know. It’s not okay to not try.” I have found myself telling her this exact thing almost daily. We know that kids get easily discouraged and need to be told that they can do it, and to not give up, but I think that adults need this too. Creative professionals and people who are aspiring to be creative professionals are especially susceptible to feeling inadequate, myself included. We often live by the idea to “fake it till you make it” because we don’t ever want to give the impression that we don’t know something. In fact, I often take the side of just telling your client that you can do something, then you can figure it out, because this is also a beneficial thing, to challenge yourself. It’s good to embrace a challenge, and not take the easy way out, BUT, I think we undervalue the movement and growth that comes when we can just say, “I don’t know”. I’ve come to realize that I don’t need to know everything to be great at what I do. Now, when it comes to design and related fields, I think I do know a lot. But there are plenty of areas where I have had to admit to myself that I just don’t know, but I plan on trying to find out. Often when I do this, I discover so much more than if I am stubborn within myself and decide that I should know how to do this or how to explain something and just come across as an arrogant designer. When you can admit to yourself and to others that you don’t know, it will be a much easier road to tread to get to your goal. Admitting your lack of knowledge in any area shows humility and a willingness to learn from others. Can we get knowledge from those in art and design who are self-serving, know-it-all jerks? Sure, but wouldn’t we rather hear from someone who admits that they definitely do not know everything, and that they have been right where we are, stuck and frustrated. It’s so much easier to follow and relate to someone who we can see has fought past the “I don’t know” until they finally reached the “I figured it out”. Because that’s real life. No one in this world, not even the design icons or million dollar motivational speakers know everything, and if they are worth anything, they will be willing to admit that. Keep moving, don’t ever sit down and decide that you have nothing left to learn. I don’t want to sound too cheesy but honestly, you will climb virtual mountains that the people who “know everything” never even knew existed because they are sitting down at the bottom with all the things they don’t know keeping them there. You will be leaps and bounds ahead of people who have been designing for decades and have stopped learning. This week’s song has a great line, ”Stop, stop with the time you’re wasting…I can see that the closest thing to perfect is the farthest thing from me.” This is an important step in our growth, to know that we aren’t perfect and that it is literally the farthest thing from us. To try to be perfect or all-knowing are unattainable goals, but learning is always easily within reach. As an art director, I have always been able to tell when a designer is faking it. When I ask them to do something or give them a specific direction, and then ask, “does that make sense?” and they say they do, it’s usually written on their face that they really don’t. At which point I let them know, that it’s okay if they don’t get it, or don’t know, and I explain how or tell them where to find out. There is always a look of relief when they realize that I am not going to slam them or look down on them for not knowing, because I don’t know everything either, as long as they want to learn. Just remember, for the rest of your [creative] life that you don’t know everything, but one thing you do know for sure, is that you will try. You reading this blog is proof that you want to learn. Design is a wonderful world. 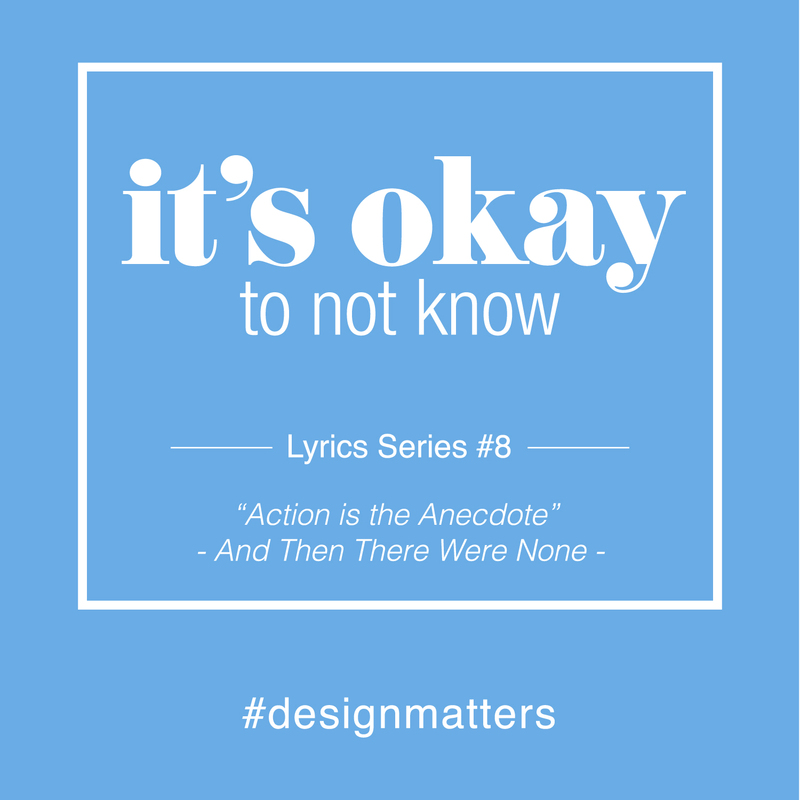 I hope you’ll join me here, because design matters.